Some more Diao ye zong goodness. 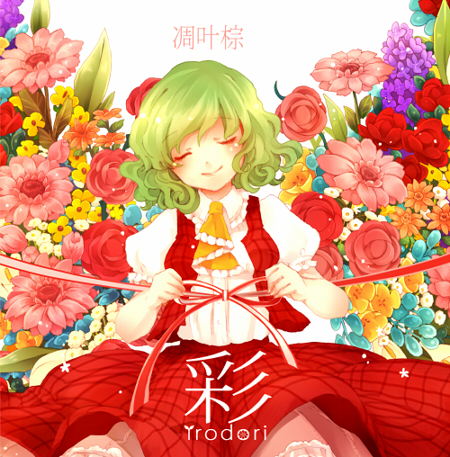 This one, as you’d probably expect, deals with Yuuka – it seems like she’s expressing her love for her flowers, which she watches over, commanding them to grow even larger and even more beautiful. As always, RD does stuff with the Japanese language that I didn’t think was possible, so I’m more than open to suggestions to help make this translation more accurate. O, beloved things! O, beautiful things! Bloom, fall, dance, and thus bloom once more – strongly, with dignity. Let us tastefully arrange the clouds, which have gathered together by chance. I shall send my thoughts to where the wind ends, wishing them a safe journey. As the seasons change, so too does the appearance of those flowers. Without the help of anyone else. Appease the earth, large-petalled flowers! In a place untouched by humans, you are naturally in full bloom. –Such a world is beautiful, no matter where you look. I only watch over you. Form a single circle, and I must be within it. Something that is the same as this ever again. That figure is a glorious kaleidoscope. Dance through the heavens, large-petalled flowers! Everything will pass away and return to that place, where humans cannot reach. –Such a world is beloved, no matter where you look. …I am closer to you than anyone, as a friend. I shall become your avatar, your symbol, as myself. And they dreamed of beautiful things. Blossom in glory, large-petalled flowers! And make them last forever. Bloom once more – strongly, with dignity. (1) ‘Life’ (命 – ‘inochi’) is written towards the start of this line, but ‘Colours’ (色- ‘iro’) is sung. (2) ‘Danmaku’ (弾幕) is written, but ‘Skill’ (技 – ‘waza’) is sung.